Why is the U.S. Government Cool with Bitcoin Now? Last year decentralized currency was labeled a black market for money laundering. In Banking on Bitcoin, the opening scene shows Charlie Shrem, a founding member of the Bitcoin Foundation, wearing an ankle bracelet awaiting a two-year prison sentence. He was charged with aiding and abetting the operation of an unlicensed money-transmitting business, Silk Road. What has changed in 2018? The prospect of having a fat tax payout is a reality for the U.S. government. They are beginning to regulate Bitcoin and popular trading platform Coinbase. It is an enviable position for the U.S. government to be in. They will benefit as more platforms support Bitcoin trading. Using the clout of Bitcoin to coerce new subscribers, Robinhood and Cash App have announced their crossover into crypto trading. In just a week, Robinhood has received almost 1 million subscriber requests for Robinhood Crypto. Square Cash’s stock gained a 3% increase, the same day of the Bitcoin trading announcement. Using the words blockchain, Bitcoin, and cryptocurrency for PR has proven to be a success. Why is Bitcoin getting this mainstream push in 2018? How does this advancement correlate with recent government interventions? 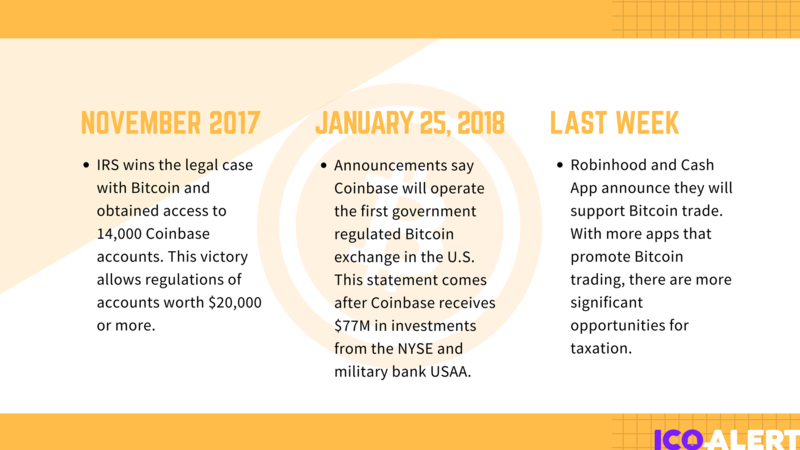 IRS wins the legal case with Bitcoin and obtained access to 14,000 Coinbase accounts. This victory allows regulations of accounts worth $20,000 or more. Announcements say Coinbase will operate the first government regulated Bitcoin exchange in the U.S. This statement comes after Coinbase receives $75 million in investments from the New York Stock Exchange (NYSE) and military bank USAA. Robinhood and Cash App announce they will support Bitcoin trade. With more apps that promote Bitcoin trading, there are more significant opportunities for taxation. How are Bitcoins and other Cryptocurrencies taxed? Recently, CNBC published a cutesy, animated crypto tax for dummies video. With emojis and stick figures, the video was not well received by the blockchain community. Trading cryptocurrency is not considered a transaction, but property according to the IRS. So, Bitcoin transactions are worth more in taxes, which means a higher percentage will be imposed. What stood out in the video was an example of a Bitcoin trader taxed a whopping 60% after transaction and accounting fees. 2. Over 200 transactions in a calendar year. The attitude around decentralized currency has changed from it is illegal, to “don’t forget to pay your taxes.” The U.S. government has found a way to tap into cryptocurrency. The new propaganda is the unappealing taxation campaign. This campaign favors traders holding their crypto for over a year, making minimum transactions, and never cashing out. It suggests the U.S government is doing everything to capitalize off of citizens using crypto, without allowing decentralized currencies to compete with the U.S. dollar. The value of all Bitcoin is $41 billion. 53% of users are from America ($21.7 billion). If taxed at an average of 20%, then the U.S government makes $4.3 billion in annual taxes.